Wired aggregated this item about a convertible bus/railcar that somehow suggests a modern take on the legendary Rio Grande Southern Galloping Goose lashups. I like the concept a great deal, especially for rapid transit in places where there are rails but not enough population density to create a dedicated passenger rail system. The technology is hardly original with Japan; I see Union Pacific maintenance pickup trucks riding the rails all up and down the old Northwestern corridor outside of Chicago every time I'm in town. The trucks straddle the tracks at a grade crossing, drop their flanged steel wheels, and then apply traction from the truck's rear rubber tires. I don't see why a passenger bus of some sort couldn't do the same thing. I don't recall when someone asked me this (or, in truth, who it was) but the decorative font used on the cover of the Degunking books for the main titles is the Chicken King font from Font Diner. The similar decorative font used in the main chapter titles is Fontdinerdotcom Loungy. Font Diner is a type foundry that specializes in retro fonts, and they have a bunch of them, generally sold in 10-font packs for $28. My uncle ran a dairy farm in Wisconsin until 1975 or so, and in addition to milk, his herd produced a mid-boggling (to me, at least) quantity of cow manure. Finally we have a small-scale mechanism for harvesting the methane produced by decaying manure. The consolidation of small dairy farms like my uncle's into monster corporate milk producers makes something like this not only economical but pretty compelling. What the open source world needs is a sort of integrated bootloader system as good as or better than Apple's BootCamp. I've been hearing about GRUB2 for a long time, but it doesn't seem any farther along than it was a year ago. Coreboot/FILO is another interesting idea, but as I read it would require close cooperation of PC hardware manufacturerswhich would be a good thing, fersure, if it would happen. (That may be the big trick.) I'm considering the commercial Bootit NG for my next machine, but in the open source world I don't see a lot happening. If I'm missing something, do let me know. A quick update on my mouth rehab, though it borders on TMI: About two weeks ago I had 30 new crowns installed, after fussing with a mouthful of temps for most of a month, one of which had a bad habit of coming loose while I was doing something innocuous, like chewing a chicken leg. That operation was not bad, though my gums got a little beat up from the sterilizing agent and dental pick work to remove excess adhesive. So now I have 30 brilliant white porcelain crowns, and if all you look at are my teeth, well, I look like a TV anchorman. But that leaves two to go. One of them was so badly damaged by six years under my previous horseshoe of connected crowns that it had to come out. The other is a healthy tooth but needed crown lengthening and a post in the middle of it, because it had gotten whittled down so far in 2001. Alas, a post requires a root canal, because the post has to go somewhere. Yesterday I went back and had the lower molar pulled, and crown lengthening (warning: NSFS) done on its opposing number in my upper jaw. That involved some bone scraping, which was one of the ugliest sounds I've ever heard, given that I could feel it in my...bones. Everything becomes quiet for about six months now. My empty socket has to heal and fill in with bone, after which the surgeon will install an implant post to hold a porcelain molar. At about the same time, I'll have a root canal done on the upper and a post installed in the middle of that tooth to hold the opposing porcelain molar. And thenegad, I hope!the whole thing will be finished. On the other hand, I thought I was finished in 2001. Silly boy. So I'm back on painkillers, though I don't need as many this time as when I had my gums reworked along the entire perimeter of my lower jaw back in January. And last night I did an interesting experiment: I installed Hardy Heron not once but twice, all while in a codeine fog. Results: It went flawlessly. Linux has clearly arrived. A week or so back I downloaded and burned the ISOs for both Ubuntu and Kubuntu 8.04, the Kubunto distro with KDE 4. I like KDE more than Gnome, because it reminds me more of Windows, and I've been looking forward to seeing V4 for several months. Both Ubuntu and Kubuntu installed without incident, each in its own 30 GB partition on my lab SX270 3.2 GHz box. I did not have the display glitches I had back in October, (even though the hardware has not changed at all) and both distros saw my network immediately. I installed a bunch of things with the Adept installer, including some games, Boa Constructor (a vaguely Delphi-ish RAD environment for Python) and some office apps. No problems there, and Boa Constructor is worth a little experimenting and some description as time allows. My only complaint so far is a minor one: GRUB is ugly, and needlessly so. Suse and Fedora (I think) already have a graphical GRUB OS selection screen. Given the importance Ubuntu places on nontechnical users, I think it would be worthwhile to budget a little work for creating one and including it in the default distros. The reasons are not entirely esthetic. Nontechnical people almost never see text screens anymore (except for a vanishingly quick appearance while BIOS POST does its thing) and when they do, it almost always means that something is wrong. Leaving a general good impression of desktop Linux is vital right now, as from what I can see, the OS itself is ready. A quick skim of the Ubuntu forums online indicates that it's possible to install a graphical GRUB display in Ubuntu, and I'm going to give it a shot today or tomorrow, when the codeine is no longer necessary and I can run my brain on all cylinders. In the meantime, if any of you have any experiences (good or bad) with graphical GRUB displays, I'd appreciate hearing them. Our neighbors Lena Olson and David Kuchinski came by for dinner last night, and Lena brought her Canon G9 digital camera. 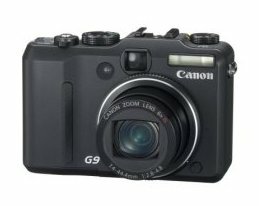 I've been looking for the successor to my well-used Kodak V530, and the G9 is an extremely impressive item. I was thinking that to get all of what I wanted, I would have to stay small and also go big, all the way up to a Digital Rebel SLR or something like it. The G9 falls somewher in the middle, and is about the same size and heft as the compact 35mm film cameras that Carol and used in the 80s and 90s. I have some complaints about the V530, but it slips easily into my pocket and is all-metal on the outside, which is good if it's sharing the pocket with my keys and my usual quarter-pound of loose change. The V30 is great if you're going walking and want to catch the elusive Colorado wild turkeys that I seem to see only when I don't have a camera in my pocket. (Local bears are not as shy.) However, I do need something with more control over exposure, a somewhat better flash, more battery life, and (especially) better macro capability. One of the things I want to do is take better pictures of smallish, small, and very small objects. Not microscopic objectsjust things down, perhaps, to the size of a quarter. The V530 can focus on things that small, but its depth of field isn't good, its auto focus feature sometimes focuses on the wrong part of the artifact, and exposure control is poor for anything at macro range. Lena is an award-winning sculptor, and artistic in ways I can never hope to be. I trust her judgment about artist tools generally, including cameras. She thinks the G9 is the best camera she's ever triedand after I explained what I was looking for, she declared it just the thing and left it with me for a couple of days to see for myself. I took a few test shots with it this morning out on the back deck (where the diffused light of a mildly cloudy day was especially good) and am much impressed. This was taken without knowing anything at all about what can be done with the camera's special options, and at least for Lulu projects, I consider it publication-quality. I want to see about increasing the depth of field while reducing shadows, but what I got was probably good enough. The photos I show here (both taken this morning) don't really put across how much detail is present in the digital files, which in their native mode are 3000 X 4000 pixels in size. You can zoom in until you fill the screen with an octal tube socket, which (for tube geeks like me, at least) was mighty surreal. It's not significantly more expensive than the V530 was a couple of years ago (about $400 online) and looks like it will do the job. We'll see. As an aside, I'm going in tomorrow morning to get a tooth pulled and the socket bone-grafted. The surgeon is also going to trim the gumline around the opposite molar. I'm likely to be under a fog all day tomorrow (and perhaps part of Wednesday) and may not post for a few days. Man, this dental project is getting old. Someone's invented a glass jar with a screw-on lid on both ends. Makes sense: By the time you reach the bottom of the peanut butter, most of the oil is gone and what's left is as hard as a rock. Or, alternate lids and gradually work your way toward the middle. If you keep alternating which end is up, the oil won't be as likely to collect on either end and the peanut butter may stay softer until it's all gone. Bruce Baker directs us to a Webring of homebrew CPUs. No VLSI. No LSI. Maybe TTL chips. Or discrete transistors. Or relays. 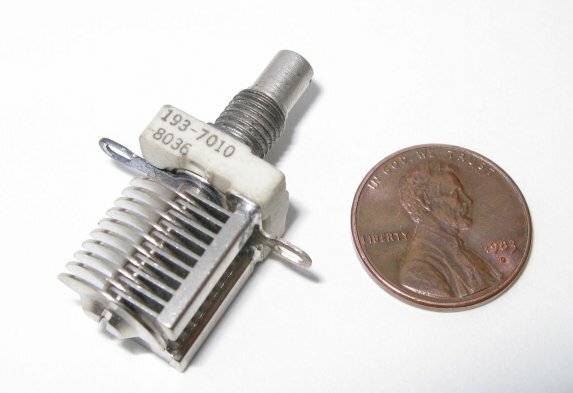 I wire-wrapped a COSMAC machine with 2K of RAM back in 1977, and I thought it was a job. Wow. As an individual with a "special relationship" to calculus (and a special fondness for filk) I damned near bust a gut watching this. The Slashdot commenters (who are interesting all by themselves) need to get a life, or at very least a sense of humor. Most of them weren't even alive when Disco was first-run, and so I suspect the comedy shoots right by them. Epson has been demonstrating a proof-of-concept model of an A4-sized e-ink display with a mind-boggling resolution of 3104 X 4128 pixels, in monochrome. 385 DPI is more than enough for monochrome graphics (though gray-level depth is not stated) and within a few years, a full-sized letter/A4 ebook reader will not only be possible but inevitable. 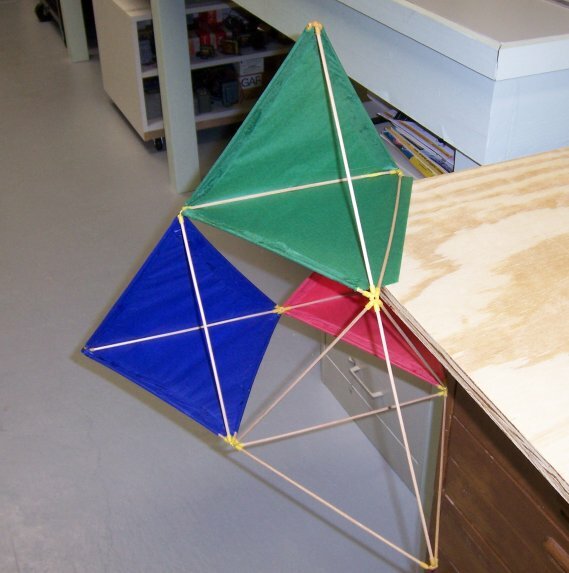 From Jan Westerlink comes a pointer to a wonderful gallery of home-made kites, including one I especially like, especially in light of yesterday's entry: A 4-cell tetrahedral made by rubber-banding 24 bamboo shish-kebob skewers together. Scroll down to pictures 24 and 25. Beautifully done, if a little prickly: If that thing dives toward you, duck! May 24, 2008: The D-Stix Kite Flies Again! 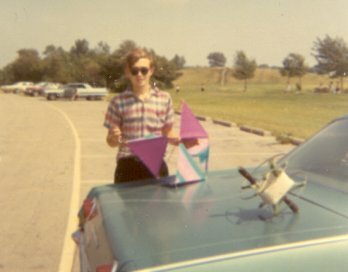 As we concluded our first date back on July 31, 1969, I somewhat apprehensively asked Carol if she would go out flying a kite with me on the following Saturday. 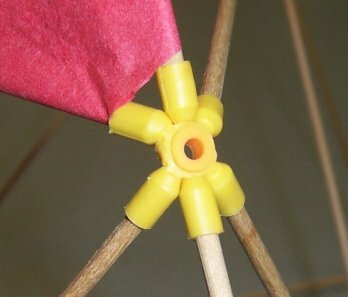 I was building a tetrahedral kite out of my D-Stix set, and although my intuition was that this was not the way to impress girls, I gave it a shot, and she accepted. And so it was that we piled into my mom's '65 Biscayne and took my D-Stix tetra out to the huge Forest Preserve field at Irving Park Road and Cumberland. The kite didn't fly well, if I recall correctly (and in truth, most of what I remember about that Saturday afternoon was Carol) but we both had a great time. An hour or so in, the kite smashed into the ground and broke a couple of sticks, but I salvaged the yellow connector piecesand when I recently pulled down the butter dish that the D-Stix connectors had been in since who knew when, begorrah, they were still in there, including one with some kite string still tied through the hole. It was a natural. I took the same damned D-Stix pieces, bought some 1/8" dowels, and I made us another tetrahedral kite. At some point I will create a Web page describing its construction in detail, but I'll just insert a few photos here. A typical joint is at right. The yellow connector originally had eight "ears," but I snipped two off with a dykes to make the requisite six. (The four outer vertices were six-bangers from which I snipped three.) The paper was ordinary Hobby Lobby artsencrafts tissue, which I glued with Elmer's glue. Mucilage would be betteror at least more historically accuratebut they don't sell that at Hobby Lobby anymore. Building the kite didn't take much doing. I assembled the D-Stix frame, cut out some conjoined equilateral triangles of tissue, and glued the tissue to the frame. There were a couple of tricky glue joints, but nothing that a protruding corner of a chunk of plywood didn't finesse. All in all, it took maybe an hour. And it flew. Sorta. Carol and I got it into the air down at the park along Highway 115, but the wind was strong and erratic and I had to hang some tail on it to keep it aimed skyward. It had a tendency to lean left, and after a few minutes of tearing around the great blue sky like a puppy suddenly released from its kennel, it did The Dive, and mashed itself against the grass just like its previous incarnation had, almost 39 years earlier. Two sticks popped out of their sockets, and the tissue ripped into two places, but it's nothing a clever geek can't fix. It was beautiful. (And weird.) Just like Carol (and me.) 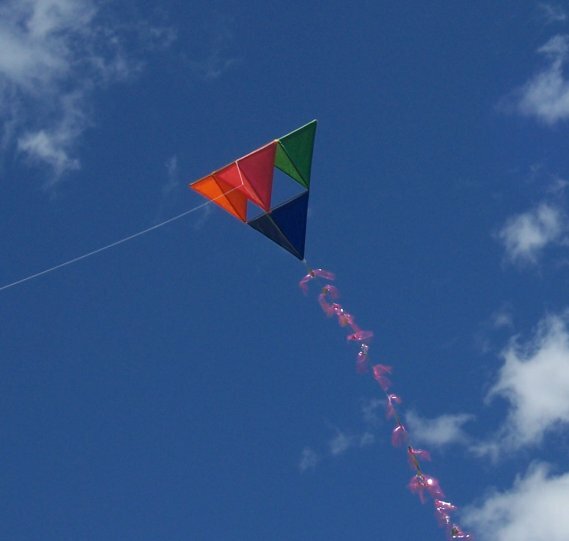 We laughed, and laid back in the grass, and reflected that life can be good on a brisk Saturday, with a kite and some string and a willingness to let all the rest of it just blow away for awhile. As I've mentioned here a time or two, I've been gradually recasting my 1993 book Borland Pascal 7 From Square One for the current release of FreePascal. It's turned out to be a larger project than I had expected for a number of reasons, some of them humbling (I was not as good a writer in 1984 as I am today) and some completely unexpected. The one that came out of left field stems from the fact that Pascal isn't used in the US that much anymore. Most of the audience for the new book is in Europe, and while most of them understand English, they understand correct, formal, university-taught English. Not slangy, quirky, down-home, Jeff Duntemann feet-up-on-the-cracker-barrel English. QBit stretches and climbs on my chest, wagging furiously as though to say, "Hey, guy, tempus is fugiting. Shake it!" ...and write the plan in German, to boot. ...cats are pets, not hors d'oerves on the hoof. But some were. The expression "to run errands" is not universally understood there. Nor is the word "shack." (I changed it to "shed.") I want very much for the book to be accessible to those who are using Pascal the most, and that's a new kind of challenge for me: Writing plain English without resorting to clever coinages and Americanisms. It's a two-edged sword. I like writing the way I talk, and for those who haven't met me, well, I talk the way I write. It's easy. On the other hand, having worked my way through the first hundred-odd pages of the new book, straightening out my language quirks, I find that it reads very well. It doesn't sound quite as much like me, but that's OK. The idea is to keep Pascal alive, wherever and however it is to be done. Writing for the worldand not strictly for us American barbariansis a useful skill and good discipline. If I stick with Pascal and Delphi, which I have every intention of doing, you're likely to see more of it in the future. Most people know that the New Age Millerites believe that the world is going to end on December 21, 2012; if that's news to you, here's a nice overview of this deliciously deranged topic, courtesy Frank Glover. Several people online, in an almost offhand fashion, have indicated that Vista's knucklehead UAC feature is training people to click "Allow" automatically, no matter what it's asking about. That may be the single greatest design error in Vista, and could over time render Vista as insecure as anything that came before it, and certainly less secure than just working in an LUA under XP. A reader has asked me to post an entry on all magazines to which I have subscribed and re-upped at least once, but no longer subscribe to. That would be an interesting collection, and a long entry, but I'll try and get to it soon. One of that group that I might still read if I had enough time is First Things. I had a tin toy robot when I was six or seven, and it seems like most of my friends had one or two. So it was a Boomer kid-culture phenomenon, and one I don't see much about these days. Here's a photo gallery from Wired with some nice shots. Most of my early childhood nightmares were about robots and mummies, which suggests that my two subconscious fears (at least according to one amateur Jungian friend of mine from twenty-odd years ago) were of death and berserk machinery. I'm not so sure; that was what most of the cheap horror/sf flicks I saw on Channel 7 were about at that time. Another interesting article/discussion on the Fermi Paradox. Me? I think we really are alone. I don't know why just yet. If I had to guess, I'd say that it's because imagination as a mental mechanism is rare. But I've been thinking about this for thirty years and keep coming back to that conclusion. QST isn't doing too badly. It looks pretty much the way it looked twenty years ago, and it fulfills its editorial mission better than any magazine I've seen in recent times. The amateur radio demographic isn't doing well, as our average age is now up in the high 50s somewhere, but the editorial people know their readers, the ad people know their advertisers, and somehow they make it work. I just wish they'd publish a reviewor simply an announcement!of my Carl & Jerry reprints. I'm not as sanguine about The Atlantic, and haven't been for five or six years now. Still, every time my sub runs out, I re-up, having been wowed by an article or two right in the nick of time. They used to publish thought-provoking articles about things I hadn't heard about before, or didn't understand, or both. A couple of issues ago, they published a cover story about...Britney Spears! The readership apparently sent away (from one of those wonderfully eccentric little 1/12 page ads in the back of the mag, doubtless) for authentic Transylvanian torches and pitchforks and began marching on the mag's offices on New Hampshire Avenue in DC. Me, I'll be contrarian here and say that Britney didn't bother me too much. Maybe she was an experiment. Maybe the editorial staff wanted to prove to their bean counters that slutty, washed-up pop singers are not the keys to the kingdom; if so, they succeeded in spades. No, my big gripe with The Atlantic is that they became obsessed with political personalities a few years back, and now it's Obama or one damned Clinton or another on the cover almost all the time. I wouldn't mind articles about political ideas so much, but noit's all about how desperate Hilary is getting, and how Obama will learn how to walk on water by his inauguration next January. (Hint: Pray for a winter cold enough to freeze the Potomac.) I was ready to let it lapse back in January, and then they published Lori Gottlieb's brilliantly ascerbic little spitting-into-the-evolutionary-wind commentary called "Marry Him!" I re-upped. And this month, mirabile dictu! Their cover story is a reasonable layman's overview of threats to the Earth from asteroids and comets. There's the inescapable praise-for-Obama piece and a peculiar backhanded tribute to G. W. Bush, both of which I could have done without, but there was also an anguished piece by an adjunct professor teaching English to night school students tellings us that not everyone has what it takes to get a college degree. We'll see who wins come next January when I have to write another check, but my editor's intuition detects a back-office struggle between editors who think we like to read about ideas and editors who think we like to read about, um, our national mental illness. Hey, guys, John-John Kennedy himself couldn't make it work. Whatthehell makes you think you can? And then there's Wired. Like the trademark alternating color bars on their spine, I subscribe and lapse, subscribe, and lapse. The colors and the page layouts still give me headaches, but to ensure that I'm still young old (rather than old old) I have to keep in touch. 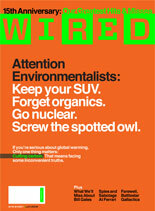 And they have their moments: The current issue's cover text is absolutely, unreservedly brilliant: "Attention Environmentalists: Keep your SUV. Forget organics. Go nuclear. Screw the spotted owl." I wanted to cheer. And then I went right for the cover story, to receive the worst impression that they had gotten the idea for the cover but then chickened out when trying to create the article. A few hundred disjointed words without much in the line of facts qualifies as a rant but hardly an idea piece, and the tiny nuggets of information they tossed in simply made me nuts to find the rest of the story somewhere. In the meantime, what the current issue tells me is that in some quarters, at least, our national mental illness is not politics but ADD. There's almost nothing in the whole issue that's more than a few hundred words long. Wired has for some time been approaching what I might call "magazine theater": Giving the reader the impression that they're reading a magazine. It's currently paid for, but I think the bar on my spine is about to change colors again. I love magazines. I guess I'm just fussy. But you knew that. I'm over at my sister-in-law Kathy's house, taking a look at her Dell SX270 computer, which I installed here last summer. She asked me to look at it because it had suddenly gotten sluggish, and I was prepared to find viruses or spyware. Instead I found a 40 GB hard drive that was 98% full, when the last time I was here it was less than 50% full. That was mighty suspicious, and I ran TreeSizeFree to tell me where all that file space had gone. It had gone into a single folder under C:\ called ~ERAFSWD.TMP, which was hogging a staggering 21 GB of disk space in many hundreds of very large files. The ~ERAFSWD.TMP folder, as it turns out, is created every time the free Eraser file shredder app begins an erasing run, and is deleted when Eraser finishes. A week or so ago, the machine's video driver crashed for reasons unclear, and had the bad karma to crash when Eraser was doing its default daily scheduled run erasing unused disk space. So Eraser had never released the temp space it allocated while it was running. The solution is simple: Exit Eraser (it's a tray app) and delete ~ERAFSWD.TMP. Then (to make it less likely to happen again) remove the scheduled erase run, which is set up by default when Eraser is installed. Eraser is most useful when emptying the Recycle Bin, and installs a Recycle Bin context menu item for that purpose. Unless you work with a great deal of confidential information, daily scheduled free space erasing is massive overkill. I do a free space run on demand every few months. It was my own damned fault, as I had installed Eraser on this machine last summer without removing the daily scheduled run. Sometimes even a master degunker generates massive gunk. Mea culpa. As part of my research for Degunking Essentials (basically a condensation and updating of my three Degunking titles) I happened upon a free disk defrag utility that's worth trying: UltraDefrag. It's open source and hosted on Sourceforge, meaning it's safeat least if that's where you get it from. The defrag utility built into Windows 2000 and XP is a crippled version of Diskeeper. It defrags but does not compactthat is, it does not consolidate the defragmented files toward the low end of the hard drive, and sometimes leaves a large number of contiguous files scattered around on the drive. The commercial version of Diskeeper is quite good and I bought it years ago, but UltraDefrag seems to do everything Diskeeper does, and it's free. UltraDefrag compacts files, separating files and free space. As an option it can also defragment the page file at boot time, something I've never done. (I don't perceive any increase in responsiveness having done it, though. I doubt it has to be done very often.) The UI is less whizzy, but results are what you're looking for, not flashy graphics. UltraDefrag is small, simple, reasonably fast, and easy to use. Get it here. Highly recommended. Sorry for the recent quietude here; the weekend was a whirlwind, and it took all of yesterday just to catch my breath. Scott Kurtz' PvP webcomic celebrated its first ten years by showing us that Brent Sienna actually has eyes. Wow. Allan Heim sent me a pointer to a nice article on the Fermi Paradox that expresses a position I have been drifting toward for most of my life: That we are probably alone in the universe, perhaps not only as intelligent, tool-building beings but also as living things, period. The author makes a case that being alone in the universe would be very good news, but not for the reason you might think. Read it. Borland is apparently selling their CodeGear division (which develops and supports Delphi) to Embarcadero Technologies, a database tools company. This was not unexpected, and to be honest with you, I can't tell if it's a good idea or not. One of Delphi's most serious problems is that it got so good after five or six years that most people stopped upgrading; I'm amazed at how many people are still using Delphi 6. The cost of the product was also an issuethere is no ~$100 starter editionand the Turbo Delphi Explorer experiment demonstrated how important the ability to install components was. An amazing number of people wrote to me to say that they downloaded the free product, installed it, fooled with it for a week or so, and then went back to Delphi 6. From Mike Sergent comes a pointer to a NYT piece indicating that most people do not have the training to discern the level of subtlety in wine flavor that they claim to, and that a lot of it may exist mostly in our heads anyway. This is not news (to me, at least) but it's nice to see it going mainstream. Michael Covington posted a fascinating graph of changes in home prices from Q4 2006 to Q4 2007, suggesting that the "housing bubble" has not been evenly distributed. The coasts have suffered, as have most major cities and trendy places like Colorado's Front Range, but flyover places like Nebraska and Wyoming have posted solid increases in that time. In addition to that, sharp differences by state suggest that state-level housing and banking policies have more to do with housing cost changes than most people are willing to admit. The other day I found myself thinking something remarkable (for me): I would rather buy a Mac and run my essential Windows apps in a Parallels window (or in a compatibility box like Crossover) than move to Vista. Bill & Gretchen returned home from Madison yesterday with their new baby, Juliana Leigh. They were a little ragged from the stress of the adventure and spending almost a week in a hotel room, but the payoff was difficult to calculate: the little girl sleeping on Gretchen's shoulder. Mission accomplished: Julie is home. Gretchen dropped her in my lap and I held her for a little while, Gretchen having made sure that her diaper was correctly applied and (as best she could tell) tight. Julie looked around for awhile and squirmed a little, but mostly she wanted to fall asleep. Like her sister Katie before her, she is a very placid and un-fussy baby. I heard her cry some when Gretchen changed her diaper a little later, but apart from that she took it easy on Gretchen's shoulder. She lay quietly in her magic stroller (magic in the way it folds down to nothing and slides behind the seats in their van) while we had supper at Sweet Baby Ray's, even with all the fuss that the waitresses were making over her. 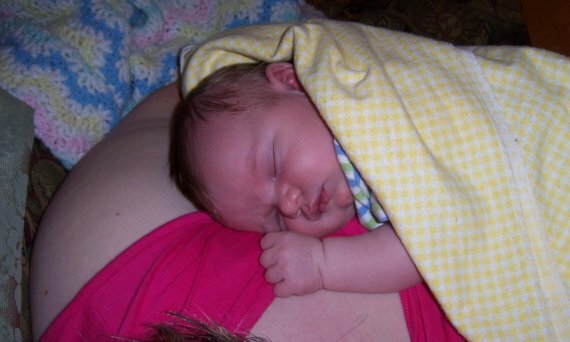 Being six days old, she still has the ruddiness of complexion that one expects of newborns, and the pale blue eyes that most infants have before their pigment develops. Bill has blue eyes. Gretchen's, like mine, are very brown. Julie's could still go either way. Nothing more to offer this morning than that. I'm working on Degunking Essentials as I have for the last few days, and will rejoin Carol later today. Tomorrow we launch south to Champaign to witness our younger nephew Matt graduate from the U of I, and with no crisp idea of my free time or connectivity, it's hard to know when I'll post again, but don't despair if you don't see anything before Monday. Here at the condo this morning, I can't bring up squat on the Web because everybody's out there trying to figure out who won the Democratic primaries last night. So I did an absolutely unheard of thing: I went down to the White Hen, got some of their great coffee, and picked up a newspaper. What a notion. I'm hearing more and more people say that Wi-Fi doesn't work as well as it used to, which is weird because microwave physics hasn't changed recently. But...look at how many APs Windows can see from wherever you are. From my kitchen table here, NetStumbler sensed twelve APs...and walking around inside our dinky little condo picked up four more. Three of the strongest signals were on default Channel 6and five out of sixteen were cleverly named "linksys." I don't think it's the physics, folks. After Meetup.com went all-paid (and highly paid) I investigated an alternative called Gatheroo, which later (in response to another damfool lawsuit from somebody) became Zanby. The site's been redesigned and is worth a look if you want to start a meatspace social network where you live. There are both free and paid levels of participation, and it's certainly not as expensive as Meetup. Matthew Reed (and lots of others after him) sent me pointers to articles about the recent implementation of memristors, which are a species of passive electronic component postulated in 1971 but not actually implemented until HP researchers made some earlier this year. Whether this interests you varies directly by the strength of your passion for electronics, and whereas I understand the concept now, my head is still spinning trying to figure out what it implies. Everybody's talking about better computer memory, sure...but what could this do in simple analog circuits? Jim Strickland sent me a pointer to a YouTube video about a flame triode amplifier/oscillator lashup, and guys, you gotta see this. 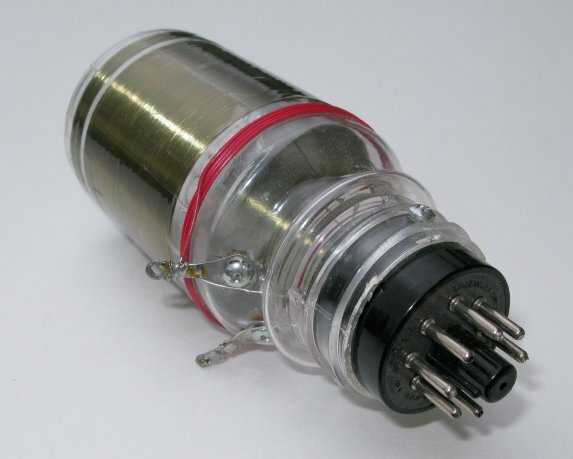 It's basically a vacuum tube without either vacuum or tube: When the electrodes get hot, it starts amplifying. I don't fully understand the physics yet, but this would be one fantastic high school science fair project. The question arose in our local group as to whether this could be considered steampunkish, and I'm not sure. People in the steampunk era had no problems generating reasonably hard vacuum and blowing glass envelopes. What they had problems with was understanding electrons. Nonetheless, with a big enough flame and some honkin' batteries, you could have done some impressive things back in 1888. Most of you have probably heard by now of Josef Fritzl, an Austrian psychopath who created a custom dungeon under his home, kept his daughter a prisoner there for 24 years, and sired seven children by her. I haven't been this disturbed by a crime since the boggling case of John Wayne Gacy, right here in NW metro Chicago, who tortured, murdered and then buried 33 young men under his house back in the 1970s. Like it or not, crimes like this prompt one to ask an ugly question: If evil like this is possible, why are we still here? Why are we not already extinct? (Those who have studied the history of the 20th Century might say it was a very near thing.) I have a theory, though I admit it's a little thin to hang the future of humanity on: It's difficult to be brilliant and evil at the same time. Evil as we define it generally comes with limitations, primarily the limitation of not being able to see yourself and your own situation very clearly. Right Men (as described by A. E. Van Vogt and Colin Wilson) are the best example: They just cannot conceive of the possibility that they are wrong. A huge number of Right Men thus never get very far in life. We see through them easily, recognize them as egomaniacal psychopaths, and do our best to avoid them. They have a bad habit of getting injured or killed in conflicts with others. Even when they somehow succeed in society to a degree, they are almost invariably humbled at some point, which is unbearable to them and often causes them to die young. As for where individual evil itself comes from, I think (against all political correctness) that it's primarily genetic. We're born along a bell curve, with Mother Teresa on one end and Stalin on the other. The optimist in me would like to think that the curve is biased toward the good. But whether or not we're evenly distributed across that bell curve, good and evil as success strategies are not symmetrical. Good is outward-looking, cooperates with others, and is generally supported by society as a whole. Evil handicaps itself in various ways. (Read Colin Wilson's A Criminal History of Mankind for hundreds of pages of examples.) Evil overestimates its chances, isolates itself, picks fights, and operates within a seriously distorted view of reality. This is fortunate, otherwise we'd long be extinct. But every now and then an evil individual gets catastrophically lucky, and we witness crimes that make us gasp. Given the huge number of moving parts in our seriously overstuffed world, this is inevitable, and the real astonishment, perhaps, lies in the fact that evil remains as rare as it is. Finally got out to Chicago and spent a mad few days visiting family and running errands, after presenting two sessions at the annual conference of the American Society for Indexing in Denver last Friday. I gave the keynote talk and it was well-receivedmy position that pages are essential and reflowability is a fetish that carries a lot of subtle dangersbut the other talk, which was basically a how-to on getting Windows to work tolerably well, was SRO. People are still struggling with Windows, and when I asked, their reaction to Vista was basically unprintable. I got the impression from their questions after the session that something like Degunking Windows needs to be done again, but covering both hardware and software in the same volume. We did a separate book a couple of years ago called Degunking Your PC, and if I do something again, it will draw on both books. I'm taking notes. We'll see if and where it wanders. Computer crankiness always seems to erupt as soon as I kick my shoes off and get to work at my Chicago-area satellite office. When I tried to answer some email here, I found to my supreme annoyance that ATT/Yahoo had changed the game again: Simply blocking port 25 and requiring that all outbound mail pass through their SMTP servers was not enough. Now they require that every From: address has to be explicitly registered on their Web site or the SMTP connection to their servers will be blocked. Screw that. I did a little research based on a fleeting memory that some hosting services listen on ports other than 25 for outbound email, and voila! My hoster listens on port 2525, and after 90 seconds' worth of tweaking Thunderbird's settings, I was able to answer mail again. Ructions didn't end there. About ten minutes after booting up, my video signal started going crazy. I took the SX270 apart, determined that the insides were squeaky clean and not especially hot, and was scratching my head after seeing the problem persist after a couple of reboots. In frustration I gave the Samsung 204B a hard whack on one side, and the video signal fell immediately back into line. Because the cables were quite tight, I can only assume that the damned thing has a loose connection somewhere internally. May 1, 2008: My Last Brin. Really. Not ten minutes ago, my brother-in-law Bill Roper called to let us know that they had gotten The Call, and he and my sister Gretchen were on their way to Madison, as their second and last child had just been born there. Those who haven't been following Contra for very long may not know precisely what's going on here, and I still boggle a little myself, SF guy though I claim to be. Recapping: For medical reasons, my sister cannot carry children to term herself. After conceiving in vitro years ago and storing the embryos under liquid nitrogen, Gretchen and Bill went off to find a gestational carrier to bring their children to term. It wasn't exactly easy, but mission accomplished: Katie Beth Roper now has a sister, born at 8:10 AM this morning, central daylight time. Nine pounds nine ounces, no problems reported. My immediate family is complete. We'll be on a plane Saturday to head out there and celebrate.